I’m a big fan of caramel. Actually, that’s kind of a redundant statement, because I don’t know anybody who isn’t a fan of caramel. If you happen to know someone who doesn’t like it, please send them my way, I’ll remedy their ailment. 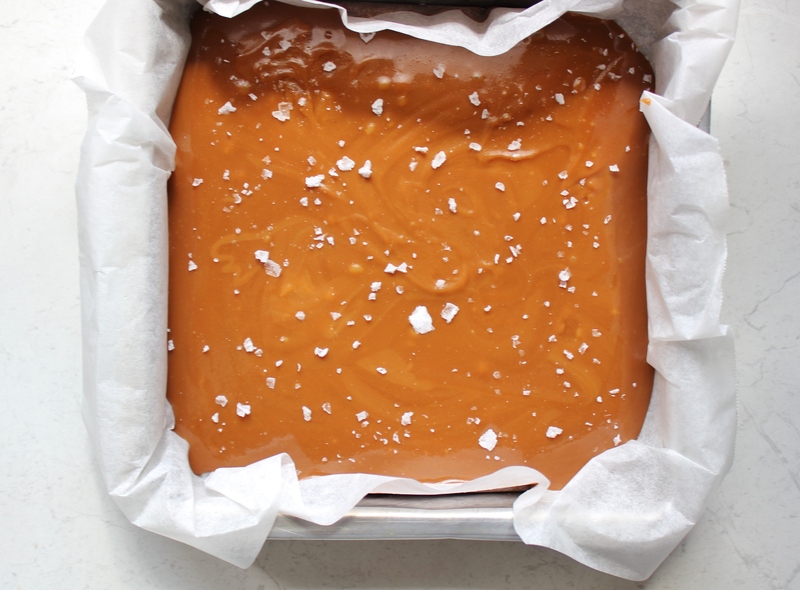 I’ve made caramel sauces and icings for the blog, but I realised today that I hadn’t posted a chewy caramel recipe. For that, I apologise. 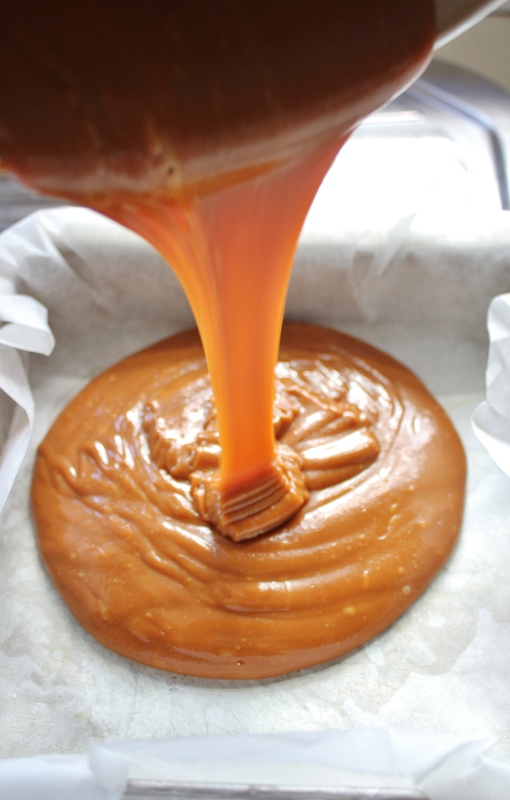 Caramel is pretty simple to make – it has a reputation for being difficult, but as long as you’re careful you should be fine. These gorgeous little mouthfuls were the top tier of my high tea set up, (the high tea that I threw to celebrate having Cristina Re tea cups on loan!) 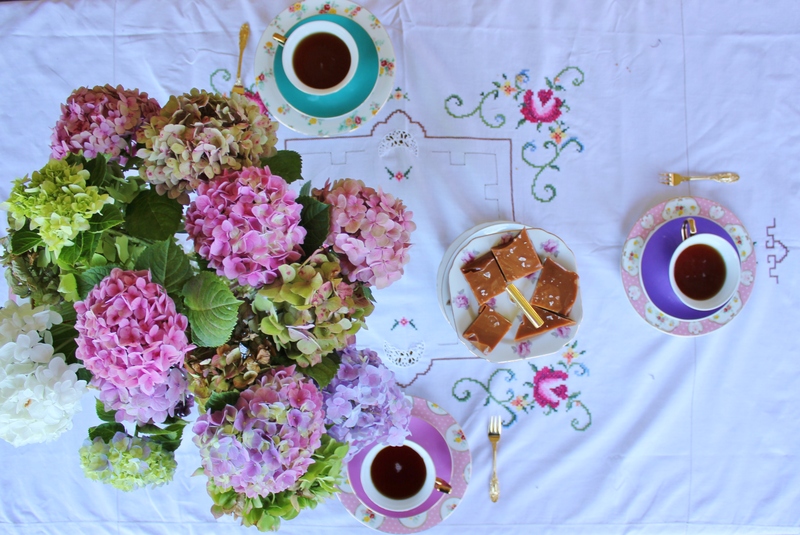 I’ll post the other two recipes from the high tea in the coming days, so keep your eyes peeled! 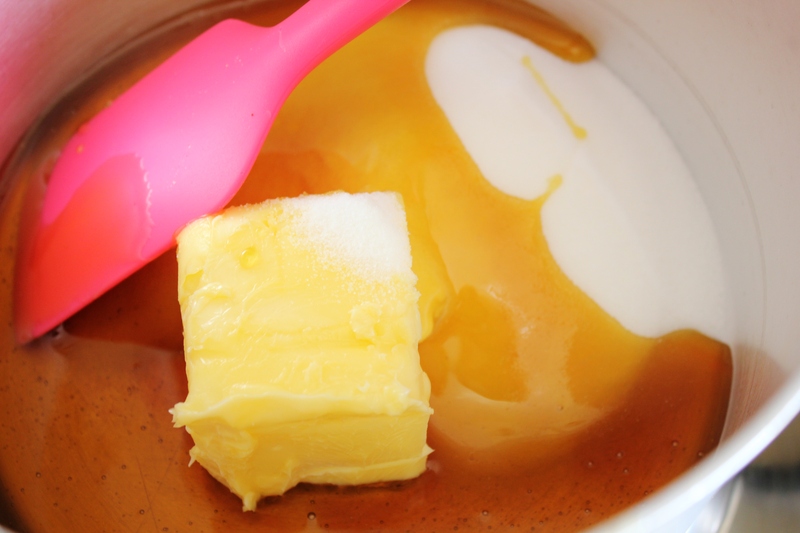 Toss the condensed milk, sugar, butter and golden syrup into a medium sized pan. Turn the heat up to medium so that the butter melts, the sugar dissolves and the mixture combines, mixing regularly. Bring the mixture to a boil and continue to boil for 10 minutes, making sure you stir consistently to avoid burning the mixture. Take the mixture off the heat and set aside to let the bubbles subside. Pour into your prepared pan and allow to cool briefly before putting in the freezer for at least an hour. Be careful, because your tin will heat up because the caramel is so hot. If you want salted caramel, take a pinch or two of salt flakes and sprinkle liberally. Remove from the freezer about ten minutes before cutting. 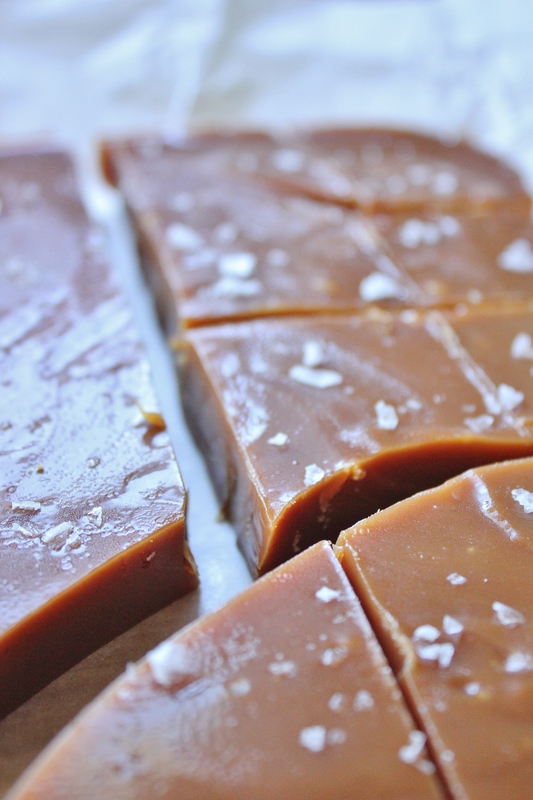 When it comes to cutting, lightly oil a knife so that it glides through the caramel more easily when you’re cutting. Personally, I like to allow the caramel to shatter slightly – when cutting, put pressure on the tip of the knife while it’s in the caramel without pressing the rest of the blade down, this should cause little fractures in the caramel. Haha so glad you agree! I don’t think I could be friends with someone who didn’t like caramel 😛 Thank you, your comments are always so lovely!! Happy to say that I LOVE caramel Gab! and with those little flakes of sea salt on top I can imagine just how delicious this little sweet treat would be! Yes! 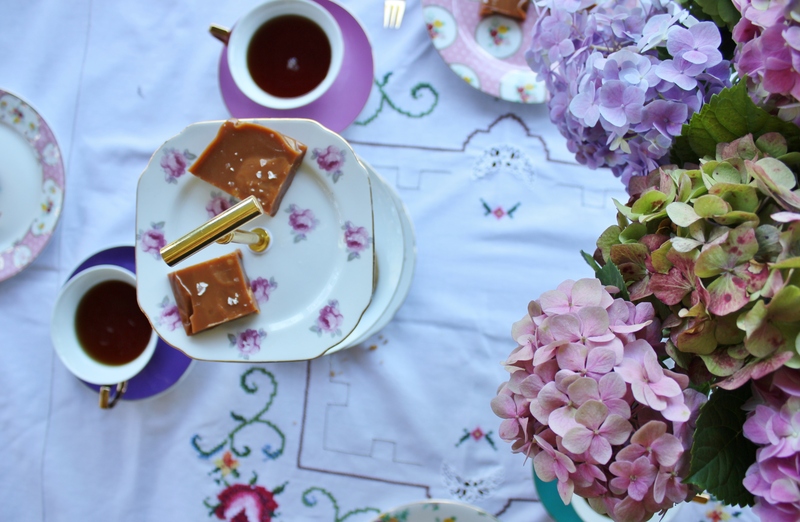 Caramel and tea! We should get along fine Gab! Haha! Well judging by your layout (same as mine!) and your recipes (totally delicious), I bet we would get along well! this looks like such a treat! Thank you 🙂 It was a bit of an indulgence!